After that you need to move to the “Candidate’s corner” which is available on your left side of the page and then you must hit the link of “Download Admit/Call Letter”. Now you have to choose “CALL LETTER OF ASSISTANT PROFESSOR IN DIFFERENT DISCIPLINES for General Degree Colleges in the W.B.E.S. under the Higher Education Deptt., GOVERNMENT OF WEST BENGAL, ADVT. NO.-12/2016” or “CALL LETTER OF ASSISTANT MANAGER UNDER THE DIRECTORATE OF CINCHONA & OTHER MEDICINAL PLANTS, IN THE FOOD PROCESSING INDUSTRIES & HORTICULTURE DEPARTMENT, GOVT. OF WEST BENGAL, ADVT. NO. – 18/2015-(4).” links and then hit on it. On the next page you are required to enter “Candidate’s First Name” and “Date of Birth”, carefully then press on “submit” button. Now your West Bengal PSC admit card will be displayed on your computer screen and after that you can download the WBPSC call letter. You must bring it at the time of examination. West Bengal public service commission conducts various examinations every year for the vacant positions. The organization was founded on 01 April 1937 that is about 80 years ago. The chairman of the west Bengal public service commission is Subhrangsu Sekhar Chatterji. West Bengal Public service commission is going to conduct Interview for the post of Assistant Professor (English/History/Economics/Physics/Chemistry) and Assistant Manager Under The Directorate Of Cinchona & Other Medicinal Plants on 24-07-2017, 25-07-2017, 26-07-2017, 27-07-2017, 28-07-2017. Aspirants should carry their necessary documents at the time of Interview. All the contenders are advised that they should reach at the venue on time. Candidates can download their west bengal public service commission admit card by going through the above mention steps. 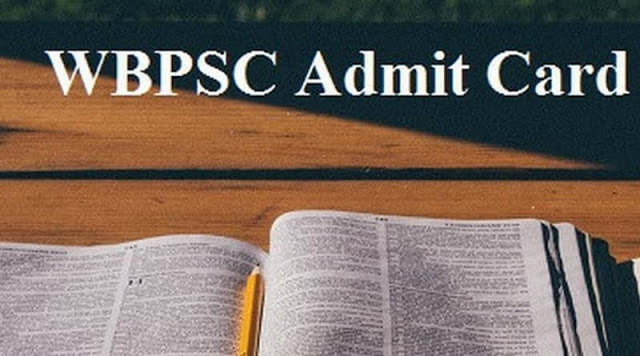 You may get the further details about WBPSC Admit Card 2017-2018 from the Official Link. If you have any query regarding west bengal public service commission hall ticket then you can ask in comment box that is stated below.